will be covered below. I am always available for additional info. not covered below. 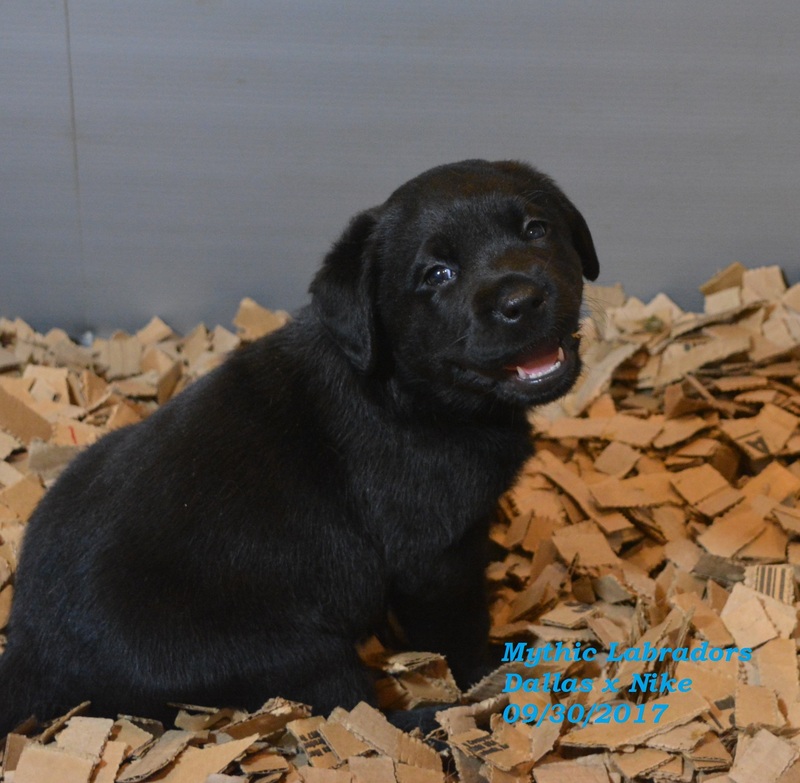 All Mythic Labradors will be AKC limited registered and will be placed on a spay/neuter contract, they will be microchipped, be de-wormed, have all age appropriate shots, and will have a health certificate issued prior to their arrival at your home. They will come with a 26 month guarantee against hip dysplasia. We also offer lifetime support for all of our puppies. We only breed a few litters a year as we want to be sure that we have enough time for each and every puppy and know that it is important to spend ample time socializing our puppies which ensures that we are raising happy, healthy and well adjusted puppies. All puppies are born in our bedroom and stay there until they are at least 3-4 weeks old (no I do not get much sleep, but at least I can roll over and make sure that all my babies are happy and nursing, small price to pay). Then I move them out to our living room and they get lots of daily stimulation and are socialized by our 2 legged children, Barrett 15 and Bailey 14. They are exposed to numerous sounds and stimulations so they are well accustomed to the sounds and situations that are in "most households". Please fill out our Puppy Application if you are interested in a pup or an adult, we would like to know a bit about you, your lifestyle, if you have ever owned a lab, your work schedule, etc. 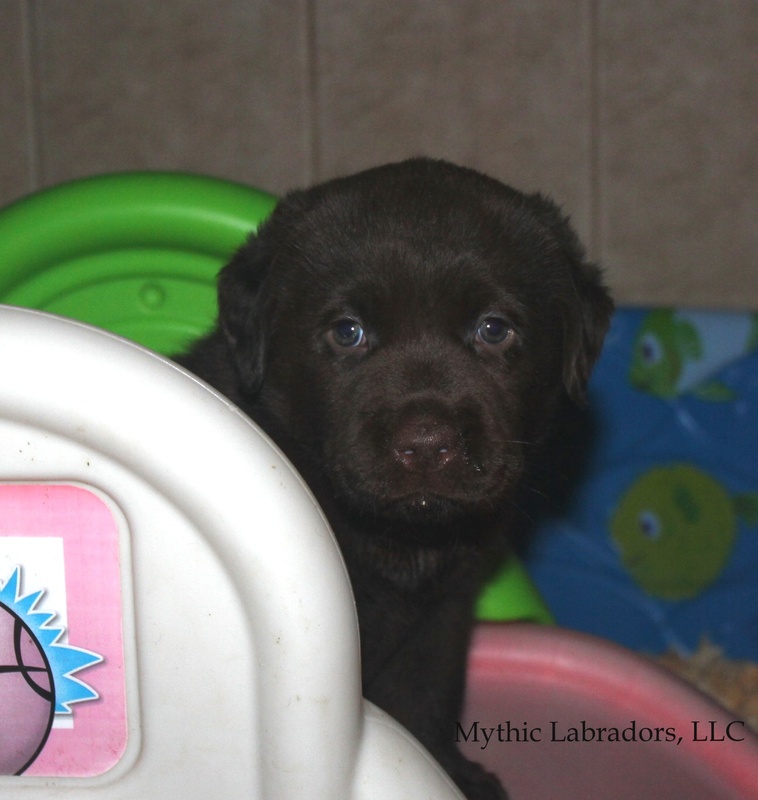 We want to be sure that a Mythic Lab is right for your family. Deposits are $500 (non-refundable), and puppies start at $2000. We only accept a limited number of deposits prior to the litter being born.